James F. Taylor enlisted for one year in the Union Army in Company B of the 1st Regiment, Volunteer Independent Alabama & Tennessee Vidette Cavalry. His younger brother William F. Taylor served in same unit. James F. Taylor applied for an invalid pension several years later on the grounds that a severe case of measles contracted during his service resulted in permanent lung damage. See the separate summary of his pension application for the details. Company B and four others were officially formed at Stevenson and Bridgeport, Alabama (adjacent towns in northeastern Jackson County) on 10 September 1863. James F. Taylor enlisted that same day at Stevenson. 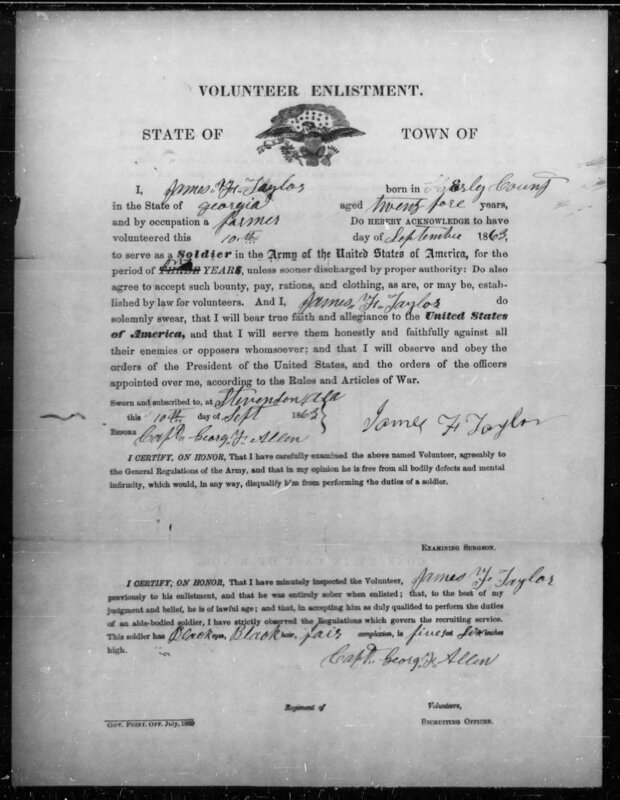 William F. Taylor enlisted at Bridgeport several months later on 1 February 1864. Both men served under Captain George F. Allen, the commander of Company B. Altogether, at least 936 men served in the Regiment. The Regiment was mustered out on 16 June 1864.